Winemaker’s Notes: Deep cherry red. A wine with tremendous aromatic complexity and a heightened expression of Cabernet fruit. Highly concentrated and persistent on the palate. Fresh, with smooth fine, and delicate tannins and excellent balance. Pair with red meats, especially lamb or wild game prepared with different cooking methods, such as roasted or braised and served with sauces made with red wine, mushrooms, rosemary, and tomatoes, among others. Assorted terrines and pates, especially duck with truffles. Cows or goat milk cheeses, dry, aged, or creamy cheeses. 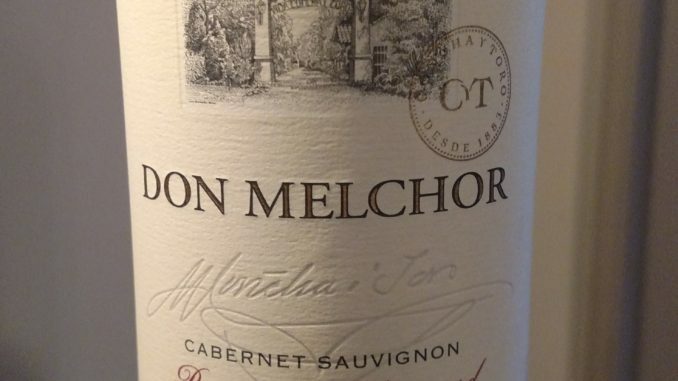 My Review: Last year I got to try the 2011 Don Melchor, so when I was offered the opportunity to try a newer vintage of the same wine, I was happy to jump at the chance. So, what did I think versus the previous vintage? Was it worth the hefty price tag? In the glass the wine was a deep cherry red color, and on the nose I picked up dark fruit, while in the mouth the wine showed notes of dark berries, herbs, and earthiness on the finish along with delicate tannins. I paired the wine with a lovely ribeye that I’d been marinating all afternoon for my birthday (turned the bit 36 this past month). Paired with the steak, the wine was great. The combination of dark fruit notes, herbs, and earthiness from the wine matched perfectly with the marinade I’d put together, especially as the wine came fresh off the grill. Compared with the previous year the wine was bigger and showed more earth. While I liked the previous vintage, if I’m going to spend $125 on one of them, I’d personally go with the 2013 vintage as it lined up better with what I like in my wine. As to whether or not it’s worth the price…not unlike last year, that’s a question you can really only answer for yourself. It’s a great bottle of wine, and I understand that the economics of this can include the size of the vintage. That being said, this wine as real aging potential, so picking up a bottle of it now and being patient could pay big dividends if you’re looking to have a real special bottle of wine in a few years. Editor’s Note: I received this bottle of wine as a free sample for review.